For the calibration of relatively short distances the team observed Cepheid variables. These are pulsating stars which fade and brighten at rates that are proportional to their true brightness and this property allows astronomers to determine their distances. The researchers calibrated the distances to the Cepheids using a basic geometrical technique called parallax. With Hubble’s sharp-eyed Wide Field Camera 3 (WFC3), they extended the parallax measurements further than previously possible, across the Milky Way galaxy. To get accurate distances to nearby galaxies, the team then looked for galaxies containing both Cepheids and Type Ia supernovae. Type Ia supernovae always have the same intrinsic brightness and are also bright enough to be seen at relatively large distances. By comparing the observed brightness of both types of stars in those nearby galaxies, the team could then accurately measure the true brightness of the supernova. Using this calibrated rung on the distance ladder the accurate distance to additional 300 type Ia supernovae in far-flung galaxies was calculated. They compare those distance measurements with how the light from the supernovae is stretched to longer wavelengths by the expansion of space. 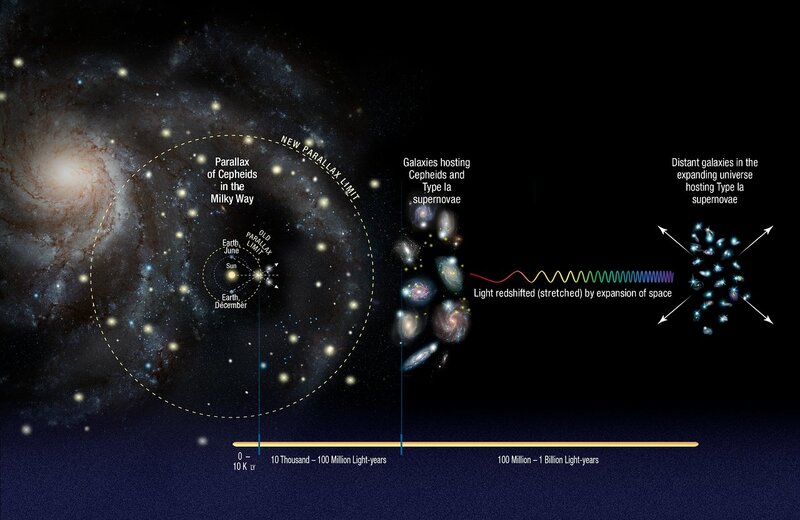 Finally, they use these two values to calculate how fast the universe expands with time, called the Hubble constant.